Press conference of Margrethe Vestager, Member of the EC in charge of Competition, on an antitrust case. © European Union , 2018 / Source: EC – Audiovisual Service / Photo: Jennifer Jacquemart. The European Commission has fined Google €4.34 billion for breaching EU antitrust rules. 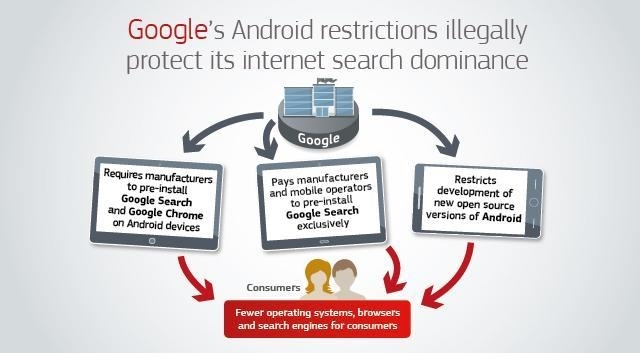 Since 2011, Google has imposed illegal restrictions on Android device manufacturers and mobile network operators to cement its dominant position in general internet search. Google must now bring the conduct effectively to an end within 90 days or face penalty payments of up to 5% of the average daily worldwide turnover of Alphabet, Google’s parent company. Google obtains the vast majority of its revenues via its flagship product, the Google search engine. The company understood early on that the shift from desktop PCs to mobile internet, which started in the mid-2000s, would be a fundamental change for Google Search. So, Google developed a strategy to anticipate the effects of this shift, and to make sure that users would continue to use Google Search also on their mobile devices. In 2005, Google bought the original developer of the Android mobile operating system and has continued to develop Android ever since. Today, about 80% of smart mobile devices in Europe, and worldwide, run on Android. When Google develops a new version of Android it publishes the source code online. This in principle allows third parties to download and modify this code to create Android forks. The openly accessible Android source code covers basic features of a smart mobile operating system but not Google’s proprietary Android apps and services. Device manufacturers who wish to obtain Google’s proprietary Android apps and services need to enter into contracts with Google, as part of which Google imposes a number of restrictions. Google also entered into contracts and applied some of these restrictions to certain large mobile network operators, who can also determine which apps and services are installed on devices sold to end users. The Commission decision concerns three specific types of contractual restrictions that Google has imposed on device manufacturers and mobile network operators. These have enabled Google to use Android as a vehicle to cement the dominance of its search engine. In other words, the Commission decision does not question the open source model or the Android operating system as such. The Commission decision concludes that Google is dominant in the markets for general internet search services, licensable smart mobile operating systems and app stores for the Android mobile operating system. Google is dominant in the national markets for general internet search throughout the European Economic Area (EEA), i.e. in all 31 EEA Member States. Google has shares of more than 90% in most EEA Member States. There are high barriers to enter these markets. This has also been concluded in the Google Shopping decision of June 2017. Android is a licensable smart mobile operating system. This means that third party manufacturers of smart mobile devices can license and run Android on their devices. Through its control over Android, Google is dominant in the worldwide market (excluding China) for licensable smart mobile operating systems, with a market share of more than 95%. There are high barriers to entry in part due to network effects: the more users use a smart mobile operating system, the more developers write apps for that system – which in turn attracts more users. Furthermore, significant resources are required to develop a successful licensable smart mobile operating system. As a licensable operating system, Android is different from operating systems exclusively used by vertically integrated developers (like Apple iOS or Blackberry). Those are not part of the same market because they are not available for licence by third party device manufacturers. Google is dominant in the worldwide market (excluding China) for app stores for the Android mobile operating system. Google’s app store, the Play Store, accounts for more than 90% of apps downloaded on Android devices. This market is also characterised by high barriers to entry. For similar reasons to those already listed above, Google’s app store dominance is not constrained by Apple’s App Store, which is only available on iOS devices. Google has engaged in three separate types of practices, which all had the aim of cementing Google’s dominant position in general internet search. Google offers its mobile apps and services to device manufacturers as a bundle, which includes the Google Play Store, the Google Search app and the Google Chrome browser. Google’s licensing conditions make it impossible for manufacturers to pre-install some apps but not others. As part of the Commission investigation, device manufacturers confirmed that the Play Store is a “must-have” app, as users expect to find it pre-installed on their devices (not least because they cannot lawfully download it themselves). First, the tying of the Google Search app. As a result, Google has ensured that its Google Search app is pre-installed on practically all Android devices sold in the EEA. Search apps represent an important entry point for search queries on mobile devices. The Commission has found this tying conduct to be illegal as of 2011, which is the date Google became dominant in the market for app stores for the Android mobile operating system. Second, the tying of the Google Chrome browser. As a result, Google has ensured that its mobile browser is pre-installed on practically all Android devices sold in the EEA. Browsers also represent an important entry point for search queries on mobile devices and Google Search is the default search engine on Google Chrome. The Commission found this tying conduct to be illegal as of 2012, which is the date from which Google has included the Chrome browser in its app bundle. on Windows Mobile devices (Google Search and Chrome are not pre-installed) less than 25% of all search queries were made via Google Search. More than 75% of search queries happened on Microsoft’s Bing search engine, which is pre-installed on Windows Mobile devices. Google’s practice has therefore reduced the incentives of manufacturers to pre-install competing search and browser apps, as well as the incentives of users to download such apps. This reduced the ability of rivals to compete effectively with Google. Google granted significant financial incentives to some of the largest device manufacturers as well as mobile network operators on condition that they exclusively pre-installed Google Search across their entire portfolio of Android devices. This harmed competition by significantly reducing their incentives to pre-install competing search apps. The Commission’s investigation showed that a rival search engine would have been unable to compensate a device manufacturer or mobile network operator for the loss of the revenue share payments from Google and still make profits. That is because, even if the rival search engine was pre-installed on only some devices, they would have to compensate the device manufacturer or mobile network operator for a loss of revenue share from Google across all devices. In line with the recent EU court ruling in Intel, the Commission has considered, amongst other factors, the conditions under which the incentives were granted, their amount, the share of the market covered by these agreements and their duration. On this basis, the Commission found Google’s conduct to be illegal between 2011 and 2014. In 2013 (after the Commission started to look into this issue), Google started to gradually lift the requirement. The illegal practice effectively ceased as of 2014. The Commission also assessed in detail Google’s arguments that the granting of financial incentives for exclusive pre-installation of Google Search across the entire portfolio of Android devices was necessary. In this regard, the Commission dismissed Google’s claim that payments based on exclusivity were necessary to convince device manufacturers and mobile network operators to produce devices for the Android ecosystem. Google has prevented device manufacturers from using any alternative version of Android that was not approved by Google (Android forks). In order to be able to pre-install on their devices Google’s proprietary apps, including the Play Store and Google Search, manufacturers had to commit not to develop or sell even a single device running on an Android fork. The Commission found that this conduct was abusive as of 2011, which is the date Google became dominant in the market for app stores for the Android mobile operating system. This practice reduced the opportunity for devices running on Android forks to be developed and sold. For example, the Commission has found evidence that Google’s conduct prevented a number of large manufacturers from developing and selling devices based on Amazon’s Android fork called “Fire OS”. In doing so, Google has also closed off an important channel for competitors to introduce apps and services, in particular general search services, which could be pre-installed on Android forks. Therefore, Google’s conduct has had a direct impact on users, denying them access to further innovation and smart mobile devices based on alternative versions of the Android operating system. In other words, as a result of this practice, it was Google – and not users, app developers and the market – that effectively determined which operating systems could prosper. The Commission also assessed in detail Google’s arguments that these restrictions were necessary to prevent a “fragmentation” of the Android ecosystem, and concluded that these were not well founded. First, Google could have ensured that Android devices using Google proprietary apps and services were compliant with Google’s technical requirements, without preventing the emergence of Android forks. Second, Google did not provide any credible evidence that Android forks would be affected by technical failures or fail to support apps. The Commission decision concludes that these three types of abuse form part of an overall strategy by Google to cement its dominance in general internet search, at a time when the importance of mobile internet was growing significantly. First, Google’s practices have denied rival search engines the possibility to compete on the merits. The tying practices ensured the pre-installation of Google’s search engine and browser on practically all Google Android devices and the exclusivity payments strongly reduced the incentive to pre-install competing search engines. Google also obstructed the development of Android forks, which could have provided a platform for rival search engines to gain traffic. Google’s strategy has also prevented rival search engines from collecting more data from smart mobile devices, including search and mobile location data, which helped Google to cement its dominance as a search engine. Furthermore, Google’s practices also harmed competition and further innovation in the wider mobile space, beyond just internet search. That’s because they prevented other mobile browsers from competing effectively with the pre-installed Google Chrome browser. Finally, Google obstructed the development of Android forks, which could have provided a platform also for other app developers to thrive. The Commission’s fine of €4 342 865 000 takes account of the duration and gravity of the infringement. In accordance with the Commission’s 2006 Guidelines on fines (see press release and MEMO), the fine has been calculated on the basis of the value of Google’s revenue from search advertising services on Android devices in the EEA. The Commission decision requires Google to bring its illegal conduct to an end in an effective manner within 90 days of the decision. The decision does not prevent Google from putting in place a reasonable, fair and objective system to ensure the correct functioning of Android devices using Google proprietary apps and services, without however affecting device manufacturers’ freedom to produce devices based on Android forks. It is Google’s sole responsibility to ensure compliance with the Commission decision. The Commission will monitor Google’s compliance closely and Google is under an obligation to keep the Commission informed of how it will comply with its obligations. If Google fails to ensure compliance with the Commission decision, itwould be liable for non-compliance payments of up to 5% of the average daily worldwide turnover of Alphabet, Google’s parent company. The Commission would have to determine such non-compliance in a separate decision, with any payment backdated to when the non-compliance started. In June 2017, the Commission fined Google €2.42 billion for abusing its dominance as a search engine by giving an illegal advantage to Google’s own comparison shopping service. The Commission is currently actively monitoring Google’s compliance with that decision. The Commission also continues to investigate restrictions that Google has placed on the ability of certain third party websites to display search advertisements from Google’s competitors (the AdSense case). In July 2016, the Commission came to the preliminary conclusion that Google has abused its dominant position in a case concerning AdSense. Today’s decision is addressed to Google LLC (previously Google Inc.) and Alphabet Inc., Google’s parent company. The Commission opened proceedings concerning Google’s conduct as regards the Android operating system and applications in April 2015 and sent a Statement of Objections to Google in April 2016. Article 102 of the Treaty on the Functioning of the European Union (TFEU) and Article 54 of the EEA Agreement prohibit abuse of a dominant position. More information on this investigation is available on the Commission’s competition website, in the public case register under the case number 40099. The EU threatens to occupy Libya militarily; is another colonial war brewing?